We all know it’s uncomfortable to talk about it, but if there’s one place on any house that can really use a fan, it’s the bathroom. 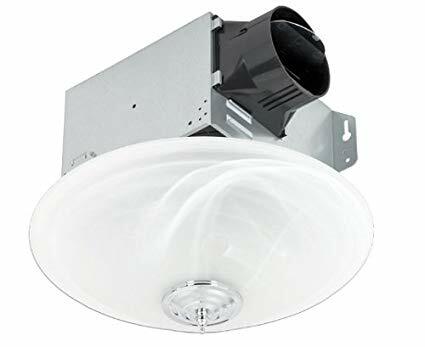 While on any other room we would expect a fan that’s simply a fan or maybe with a light, for the toilet it’s better to have bathroom exhaust fans with LED lights. These fans help with the illumination without creating heat and at the same time will extract any undesirable odor, humidity or shower fog while ventilating. While these fans are perfect for big bathrooms such as those ones in offices, schools or malls, having one on the house will considerably improve the life quality of the whole family. Some of these models even have speakers, which can help to communicate offers and ads for large stores but that’s not it! These speakers can connect to your smart device to offer you a really nice shower or bath with your favorite music. Bet you never thought a bathroom fan could do that for you! If you’re of those ones that considerate design and discreetness above all, then you can also find some of these fans hidden behind a beautiful lamp. 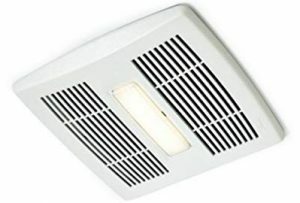 IF any of this rings a bell for what you’re looking for, then keep reading for the top-rated bathroom exhaust fans. A very quiet and strong option, this fan is the perfect halfway between fan power, illumination and a silent work. While its design is pretty industrial, the capacity of this fan is good enough to provide a solution to humidity while showering without the need of a window. Besides, it offers refreshment at the same time so you won’t have to care about bathroom heat or odor concentration at any moment. Among all the bathroom fans with led light, this has a very versatile option as it offers a bright 11 watt LED light and a 2 watt LED night light. They can be combined in a single installation or wired to a single switch each. It’s important to notice this while installing so you won’t end up with only one of the lights active. The powerful motor is permanently lubricated to avoid malfunctioning due to humidity, and at the same time, it was designed to work even to low temperature, what makes it very durable for a larger useful life. Also, the housing was designed for long-lasting useful life as it is made of rugged galvanized steel and anti-rust painting, which means it works great in a shower. Includes mounting bars with double hang adaptation and 4 and 6-inch duct adapter. Wet rated and energy star qualified. Fan, night light, and bright light can be installed separately. It’s heavy so it will need to be hanged to adjacent joists. If you are not good at electricity you may not be able to properly install the light features. While it’s fairly quiet, it still rumbles a bit. While this unit is not exactly as powerful and quiet as the previous model, it does offer a set of features that are very interesting. While it also offers the possibility of bright LED light and blue light as night illumination, the actual fan is integrated with a Bluetooth-enabled stereo speaker that allows the tech-savvy user to listen to music while on the bathroom. This Bluetooth-enabled feature allows it to wirelessly connect to any smart device such as a tablet or iPhone to control music directly from it. The best part is that, as it is integrated with the fan wiring, you don’t even have to charge the speaker. On the other hand, as the fan itself is heavily covered by the speaker mount, it might affect the purposes of the fan itself. Nevertheless, it still accomplishes its goal and it’s quiet enough to not bother the music. The design of this bathroom fan with led light is pretty modern and won’t crash the decoration purposes while the lights are very bright. The blue night light, while not being dazzling is also bright and it adds a bit of a sci-fi sensation to the area. The speaker is loud enough to offer music up to 30ft away. Fan power not so strong to give a breeze but it does take out the humidity, fog and avoid odor concentration. The speakers work permanently without the need of recharging. LED lights are cold but very bright. The blue night light is still very bright and some people may not like the sci fi/discotheque effect it gives. The fan is covered by the speaker. You need to switch all your bathroom lights to LED. 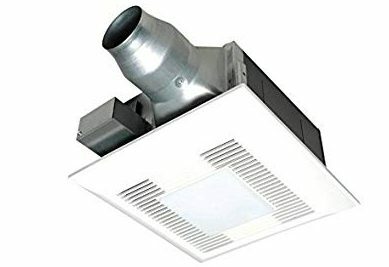 The perfect combination of design and performance is what you’ll get with this bathroom exhaust fan with LED light. Disguised under a beautiful lamp that is intended to combine with the most common bathroom finishes in the market, there’s a dimmable light that will make it easy to have just enough illumination you need for any moment. 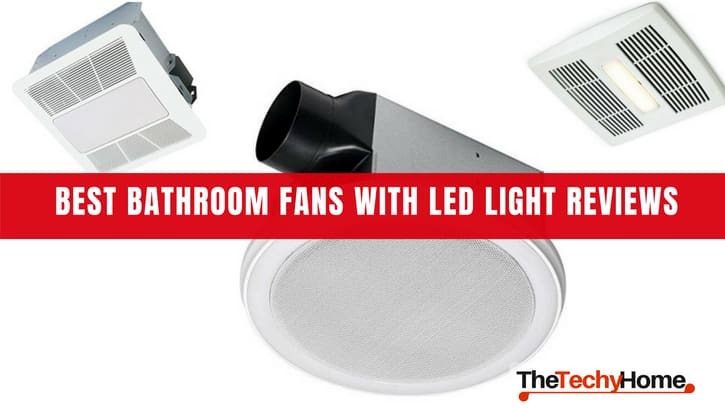 Whether it is a relaxing bath or full illumination, you got it with the LED lamp.The fan is fairly quiet and powerful to be one of the top-rated bathroom exhaust fans but it will be preferable for a small bathroom. Nevertheless, it accomplishes its purposes without a problem. IF you’re of those ones who don’t like a too white hospital-like LED light, this model is for you as the lamp globe helps the light become a bit more yellowish. The top feature is its beautiful design and finishes that are also pretty durable. The dimming light is very convenient as you don’t need to use a third switch for a night light. The fan and light can be installed separately. The LED light lasts up to 30,000 hours. The metal parts of the exhausting fan slightly show on the side of the lamp which interrupts a bit the beauty of the design. The installation may be complicated if you’re not handy. The dimming controls are not included. Very simple yet efficient, this bathroom fan with led light is very discrete and it will perfectly match any decoration thanks to its minimalist design. While this fan doesn’t offer some of the fancy features on the previous models, it is without a doubt one of the most “sure” products of its kind in the market. With several years of backup and a constant working on the development, this fan has satisfactorily served thousands of Americans. It’s completely invisible to the eye and still very powerful to withdraw any fog or humidity before it even gets into the bathroom. On the other hand, the long-lasting LED bulb endures up to 25,000 hrs of task light while not being impacted by on/off cycling. 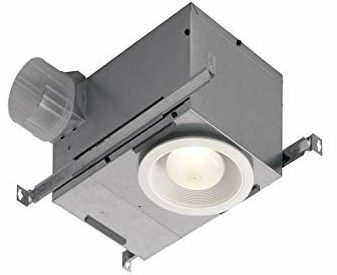 Thanks to its durable and UL listed materials, you can install this lamp-fan on top of a shower or hot tub and it is even safe for a sauna or heating room. The energy star qualification guarantees that you’ll have a functional light and fan for years without consuming as much energy as other products. The completely invisible system won’t affect your decoration while offering an excellent efficiency on fanning and light. It includes the 14 watts LED bulb. Can be used even in very humid environments and will help to keep the area breathable, completely dissipates fog in a regular bathroom. No dimmable or night light. This product comes in different levels, you need to be quietly aware of the space. you need the fan for in order to choose the right level. While Broan is without a doubt a very traditional brand when it comes to bathroom fans, they’re a bit behind when it comes to saving lightbulbs. This is the only Broan bathroom fan with led light. Nevertheless, it couldn’t be out of this review as it is definitely a great quality product that offers a great airspeed with a fairly quiet noise (under the previous models). Even though its design is not decorative, it’s pretty discrete so it will easily pass unnoticed. 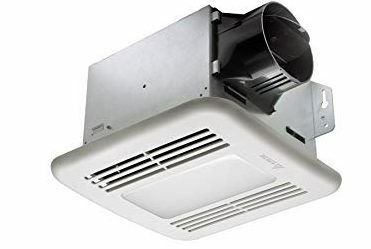 One of the best features in this fan is that it’s completely EZ-installing and you don’t even need to get attic access as it can be mounted from the bathroom. Its powerful airflow allows to completely remove fogging from large bathrooms and air leakage is reduced up to 50% compared to other models. Great airflow power while fairly quiet with TrueSeal damper technology. Diffused LED light for task illumination. UL certified for using over showers. No dimming or night light. As we get to the top rated bathroom exhaust fans reviews, we couldn’t leave outside this Delta Breeze. It’s not only one of the best performance and lower noise products available, but this company is also highly concerned about the green wage. They make their products highly energy saving to a point they even exceed Energy Star expectation in high percentages. This means that you’ll get a bathroom fans with led light that will endure the pass of time and will very efficiently accomplish its purposes. 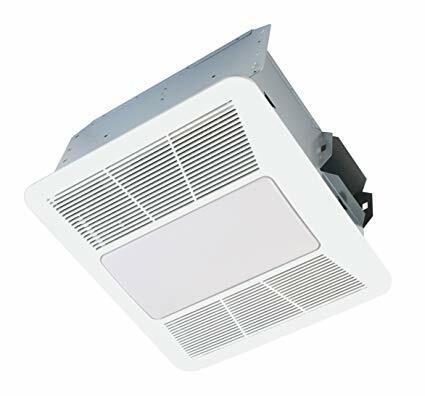 With its DC brushless motor and rust-resistant galvanized steel construction, you can be sure that this fan won’t get damaged due to use and that it will resist the humidity of any bathroom. It includes a dimmable light that makes it perfect for any occasion and even for leaving a low light on during the night. Another remarkable feature on this fan it’s that it works in an almost imperceptible volume, considerably lower than previous models. Even though you can still hear the air flowing, it doesn’t emit any kind of rumble or vibration, nor white noise. One of the quietest fans available. It highly efficient with a very low energy consumption saving up to 86% energy. Strongly constructed and with a resistant motor, this a long-lasting purchase. It includes a full range dimmable LED light. Safety feature makes the motor start slowly to check any possible electric issue but after a few seconds, it becomes very powerful. remodeling of new construction structure. 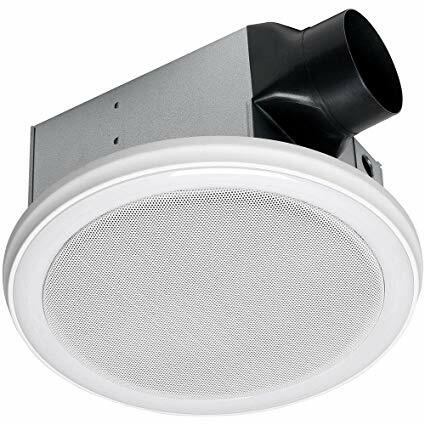 Our top-rated bathroom exhaust fan is another almost imperceptible bathroom fan with led light with the quality of a trusted brand as it is Panasonic. This fan is not only very quiet and powerful but it also offers a feature not found in any of the other reviewed fans: it has controls for adapting the airflow according to your needs. Also, the switch can be easily accessed by removing the cover which is also easily manageable. This means that you can still have some vapor for shaving but you can get rid of the fog right away after you finish or during a long hot shower. It also includes a lamp with 2 13 watts LED lights and a 2 watts LED bulb as a nightlight. While its design is not exactly beautiful, but functional, the materials on the light are great-quality plastic that seems to endure the pass of time. While not as energy saving as the previous model, this Panasonic is still constructed to match the Star Energy requirements so you can rest assured you’ll be using a green product. Moves a considerable amount of air ideal for a regular-to-big bathroom. One of the quietest models in the market. The airspeed selection feature is remarkable among these products. Installation is really easy and it includes a low profile housing depth. Task and night lights included. Functional design not very adaptable to decoration. You need to make sure to buy the right version for your quiet needs.